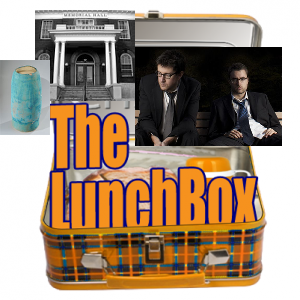 Another double-decker Lunchbox today, exploring the arts from two different perspectives! First up, Lori Quick from the UNB Art Centre dropped by to remind us all just what the centre is all about, from a working space for members, to encouraging people to discover their own artistic side through workshops, to keep UNB filled with great artwork, and more! The UNB Arts Centre is located in the Memorial Hall building on UNB Fredericton campus, with a main office on the main floor and the second floor workspace. For more information, you can also contact Lori Quick via email, lquick [at] unb [dot] ca. The UNB Art Centre will be launching Redeemed, an exhibition of photographs and a book capturing the restoration process of the Fred Ross Mural at UNB, as well as an exhibition of recently acquired works by the art bank. Second, we meet Alex Donovan and James Corbett, actors and directors swapping roles on a nightly basis for the production of Thom Pain (based on nothing). They’ve enthusiastically created this new theatre company, Imaginary Circumstances Theatre, and are looking forward to adding more contemporary and provocative theatre to our great local drama landscape. We find out their dramatic journey thus far and just how a one-man play becomes a two-man play. Thom Pain (based on nothing) runs November 1 through 3 at 7:30pm at the TNB Studio on 55 Whiting Road. They also have a matinee on Sunday at 2pm. The actor and director swap for alternate performances, so seeing it twice is like seeing it new each time!